Whether you planned on transferring from the start or you decided you needed to make a change. Whether you’re going from a two-year school to a four-year or from one four-year to another. Transferring is a big step, but you don’t have to go it alone. Here’s everything you need to do. Thinking about transferring? If so, you’re far from alone. In fact, about a third of all college students transfer from one college to another at some point in their academic journey, according to the National Student Clearinghouse Research Center. Most are those who start out at a community college then move on to a four-year college or university. But plenty of students switch from one four-year school to another. Although transferring is a routine process, it may not be a problem-free one. Too often students encounter difficulties along the way. From finding that not all of their credits transfer to discovering their new school isn’t the right fit after all, some students face disappointment. But that doesn’t have to happen to you. 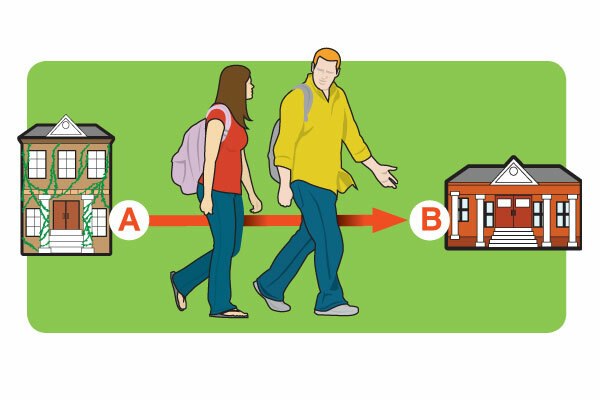 To make sure your transfer goes as smoothly as possible, follow these strategies. Before making the commitment to transfer to another college or university, you need to obtain a lot of information. When it comes to transferring, the most obvious question is, where will you go? If you have long-held plans to transfer to a specific college, this may be a no-brainer. But if you’re not sure, take the time to compare your options. Just as in selecting a college as a freshman, you’ll want to consider a host of factors for each school you’re considering. Does it offer the right program for you? How much does it really cost? What are its transfer credit acceptance policies like? Getting answers to these and other questions should be your priority. As a first step, check out college websites and publications. Many schools publish helpful transfer guides of their own. (A great example is the online guide offered by DePaul University; it offers an interactive menu where you choose things such as your current college and preferred major, and then the site generates individualized details on transferring.) Other online guides (like CollegeXpress!) provide facts on everything from general education requirements to application instructions. Some states and education organizations also offer advice on transferring. For example, the South Carolina Transfer and Articulation Center serves as a one-stop shop for transfer students and college personnel. Students can obtain online info about degree pathways, articulation agreements, and course requirements for specific majors at different schools. Your state’s higher education agency may offer similar information. Even if you obtain plenty of general info about a college or university, your transfer research shouldn’t stop there. To get an accurate look at any college you’re considering, it pays to ask specific questions. Ideally this will mean telephone or in-person conversations. Once you’ve narrowed down your choices or selected a single college, find out whom you should contact. “Each institution offers unique services to transfer students,” says Evelyn Waymire, a transfer admission counselor at Indiana Wesleyan University. At her school, transfer admission counselors serve as the first point of contact. They provide students with an unofficial assessment of how their courses might transfer. Designated transfer advisors then assist in transferring courses, ensuring credits are properly applied and helping establish a graduation plan. The University also has an external transcript evaluator who makes sure students get proper credit for previously completed courses. You may also want to speak with staff in other offices or departments, such as the financial aid office, student housing office, and the academic department you’re interested in. The career services office can also be a helpful resource. Informal campus conversations may also be revealing. If possible, talk not just to counselors or administrators but also to students who are currently attending or have recently graduated. If they were transfers, even better. Ask about how they have been treated. Find out what they like best about the college—and what they like least. Keeping in mind that no school is perfect and people will have varying opinions, try to get as clear a picture as possible of what your life as a transfer student might be like. With more and more schools offering virtual tours, you can check out many campuses without leaving your home. That’s not a bad way to begin. But before committing to any college, you should make at least one in-person visit if at all possible. “Even if you’ve been there before, it’s important to see everything with the eyes of a prospective transfer student,” says Mary Wargo, Director of Transfer and Part-Time Admissions at Quinnipiac University. “Imagine yourself on the campus. Is it a fit academically? How about socially?” She notes that open house events on campus provide a great opportunity for transfer students to interact with both current students and faculty. If an open house is not offered or you can’t make it, request a tour at a date and time convenient for you. With this option, though, be sure to arrange your visit in advance rather than showing up unannounced. If the college isn’t in an area you know well, take some time to scope out the local community. Life outside of campus is important too, and you’ll want to make sure it’s the kind of town or city where you’ll feel comfortable and happy, from the nightlife options to the hiring climate. For any college student, keeping up with degree requirements, registration deadlines, and other details is key to success. But for transfers, there’s even more to do. That’s why it pays to develop a tentative transfer plan as soon as possible and then finalize details as you progress through your studies. Other than the choice of which college to attend, the next most important question to address may be, when is the best time to transfer? Traditionally, the ideal transfer point is the completion of one course of study that leads naturally to another. Often this means earning an associate (two-year) degree at a community college and then moving on to complete a bachelor’s degree at a four-year school. But that’s not the only option. You can also transfer after completing a year or less at any college, whether it’s a two-year or four-year school. Or you can finish a couple of years of studies without earning an associate degree. Things move quickly on campus. One term blends into the next, and before you know it an academic year has flown by. Spread across that year are deadlines for submitting admission applications, financial aid forms, and more. So be sure to find out all the key deadlines for the college you’ll be attending and incorporate them into your overall transfer plan. As a transfer student, your past experience can be helpful as you go through familiar processes again. But a lot also changes the second time around, so don’t assume you know exactly what’s expected of you. Instead, double-check everything and be willing to ask for help. “Just because it worked one way at one place does not mean it’s going to work the same way at the new place,” Rogers says. “The only thing all colleges and universities have in common is that we are all different.” He says that translates to differences in meal plans, financial aid, scholarships, classroom expectations, IT services, parking, and more. Fortunately, counselors and other staff are ready and willing to offer assistance. “Transfer admissions counselors are aware that the transfer experience can seem daunting as students are leaving one community for another,” Waymire says. She notes that counselors do more than simply provide information. They also act as advocates for transfer students as they navigate their way through the transition. Counselors or academic advisors at your current school can also be quite helpful. Be sure to work with them in choosing classes so you won’t make the too-common mistake of completing courses that don’t fit at the college where you will be transferring. Similarly, as you complete course work at your current college, you’ll get to know professors and other employees who may be willing to provide advice about transferring. This can range from opinions about a potential new college to more specific insights about a program or major you’re considering. You really can’t have too much info when it comes to the major step of attending another college or university. The more you know, the better prepared you’ll be for a successful transfer. Take the time to gather all the information you need for your transfer and make sure you understand it, especially regarding credit transfers and financial aid packages. Ask questions as needed. Use your transfer application to explain any gaps in your education (such as missing semesters). Supply all transfer application documents required or requested by the published deadline dates. After you’ve been admitted to your new college, carefully follow the directions given to reserve your place. Keep your new college informed if you change any of your contact information, and be sure to respond to all communications. Be prepared to plunge into academic and student life at the school of your choice!